Many years ago, Charlie Green taught me to beware that the word “objection” is adversarial, at root. The Microsoft Word dictionary I’m using right now lists the following synonyms: “opposition,” “protestation,” “hostility.” Not the best mindset to adopt when your aim is to work from trust. The implication of the phrase “overcome objections” just makes it worse. The phrase suggests that whatever resistance you get from the other party should be handled/managed/tackled. Who wants to be handled/managed/tackled? Not I, not you, and not your clients. Personally, I’d rather you try to understand me, all-the-while making it clear that you’re the kind of person with whom I can freely share all of my concerns because you’ve made it clear you have my best interests at heart. Think about “objections” the right way. An objection is simply the client giving you information. It’s a hint—or maybe even a crystal clear communication—about concern, hesitancy, curiosity. It also sometimes a way of saying, “I like what you have to say, I just have to find a way to justify it.” Either way, it’s an invitation to engage. Once you change your thinking from “objection” to “invitation,” you’re free to get down to the business of helping your client. Pursue their concerns wholeheartedly. List them. Say things like, “Ah, I see, so you have a concern about …” Shine a light on them. Explore them. Ask to hear more of them. Lean into them. Suggest them. Meet emotion with emotion. Say (genuine) things like, “I can see why that’s troubling. You’re hesitating because _________. And that makes sense, since _________.” Not only are you likely to learn more (and can therefore do a better job of helping), you also prove you’re really listening and that you actually … drumroll … care. In the end, if you can successfully address all of your client’s concerns, great; you’ll get a sale. If you can’t, it probably means that what’s on the table is just not the right thing right now—in which case there’s only one thing to do: back out gracefully. Then you’ll not only build trust, you’ll dramatically increase your chances of making the sale when your offer is the right thing. 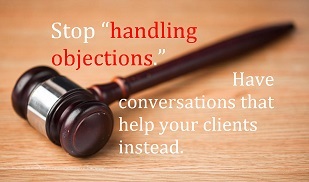 Here’s the two-line version of this entire missive: Stop handling objections. Have conversations that help your clients instead. This week, notice any tendencies you have to overcome/handle/manage when someone expresses something that sounds like an “objection”—in any context, not just a “sales” situation. Catch yourself in the act. Bonus: Try a different kind of response and see what happens. 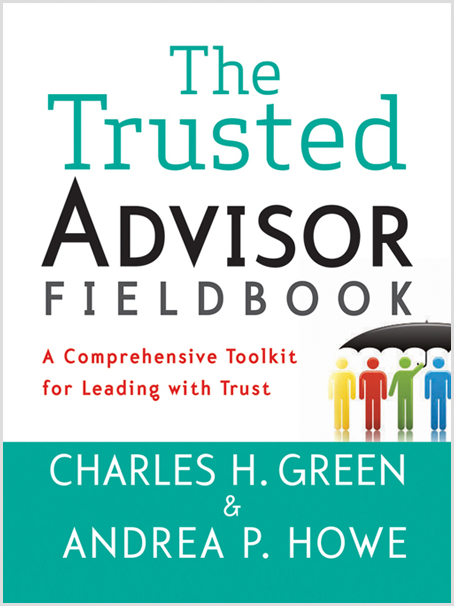 Read more about why objections are not your enemy, from our friends at Trusted Advisor Associates, or explore other ways to change your thinking about objections in Chapter 14 of The Trusted Advisor Fieldbook.